Songs and imagining the immigration myths - There is no free state without Yeats. Ireland does not exist without the Poet. 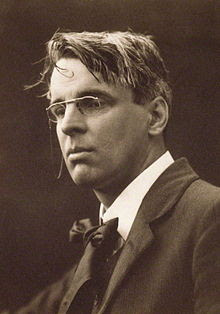 Excellent TV program recently about the Irish poet WB Yeats narrated by Bob Geldof. Yeats became the Irish National Poet. He looked at the old myths and stories and wanted to write of the spirit and voice of Ireland. He had a vision of a pluralistic, tolerant Ireland that prevails today. He was a Protestant born in Dublin. His father was a barrister and his mother’s family were from Sligo Ireland which they visited often and where he learned of the myths and magic tales from the servants. He later lived in London where he Oscar Wilde and other writers and poets. There he also met his muse, Maude Gonne, who was a revolutionary for a free Ireland. He believed in the arts, poetry and in the sovereignty of intellect and the mind. His work was about the celebration of pro Ireland NOT what Ireland is against and to celebrate Irishness – rather than oppose England. He dreamed of a modern, tolerant nation that was open and pluralistic . He wanted to tear down the idols of the market place. And he knew that nations are not about lines – and that every people need their myths. Yeats gave the Irish ‘who they were’ before the endless fighting. Yeats elevated the old heroes – political expression of a people. – Pens not guns. also wrote of the old stories and collected the old songs around Scotland, from the borders to the highlands. He too became the core and poetic voice of a true and honest Scottish voice. In 1920s after WW1 in Montrose, as part of a Scottish Renaissance there, another poet Hugh MacDiarmid took up this mantel again and he too wrote in both Scots and English – drawing on the past stories and imagining the Scotland of the future. He was one of the visionary poets that began the Scottish national civic movement.